Pair of vintage Fortuny “Glicine” pattern red and silvery decorative square pillows. Framed with burnt orange cotton velvet and embellished with small silk orange trim at seams. Backed with red cashmere fabric. These pillows were designed using the reverse side of the textile. Decorative pillows handcrafted and designed in the USA. Closure by stitch (no zipper) with custom-made pillow inserts. Who was Mariano Fortuny? ….. While painting he also became interested in photography and theatre set design. Influenced by the Arts & Crafts movement, he learned to control all aspects of his designs; for the theatre he created innovative lighting techniques, and he invented his own fabric dyes and fabrics, as well as machinery for printing cloth. He held more than 20 patents for his inventions. Abridged version from Britanica. Size: 20 x 20 x 6. 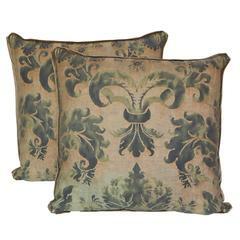 A pair of square Vintage Fortuny fabric cushions in the Glicine pattern, a 17th century Italian design. Green colorway with silk edging. Pair of unique custom blush and silvery gold colored Fortuny pillows with blush colored silk backs and self cord detail. Patterns differ on pillows per photos.